I’ve tried this Onion Chutney last week.This is used as an accompaniment for various South Indian snacks,but i like it a lot with Idli and Dosa.The recipe is from my favorite Womens magazine ‘Vanitha‘. Heat oil in the pan and saute onion till translucent.Mix together sauteed onion and all the other ingredients and grind to a smooth paste. Chutney is ready to be served. This entry was posted on August 30, 2006 at 6:19 pm	and is filed under Chutneys & Pickles, Vanitha Recipes. You can follow any responses to this entry through the RSS 2.0 feed. You can leave a response, or trackback from your own site. I am also from kerala and I FOUND YOUR WEBSITE VERY INTERESTING….I wanted to ask you which rice do you use to make idlis?? ?And also can you suggest how to use idli rawa ratio if using it instead of rice? ?Also how do you make the batter rise as mine never rises.Please help me out!! I normally use “Sona Masoori ‘ or ‘Long grain rice’.I haven’t tried with Idli rawa yet.Will give you a link and I’m sure it’ll help u..Here it is. And to make the batter rise up,just keep the mixture in some warm place for 8-10 hrs.Sometimes it can take longer than that.I always keep it inside my electric oven after preheating it for 30 seconds .I’ll be posting an Iddli recipe real soon. Thanks for visiting my blog,Mini. 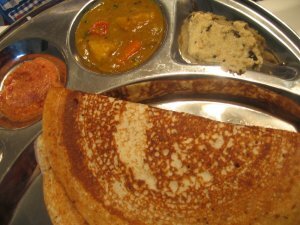 Iddliyum sambarum nannayirikkunnu…..do u cook iddlies in the tradional “IddliKuttukam”, because iddli looks big and soft……can u share the receipe of iddli. I am also from Kerala. Yeah I’ve an iddli kuttakam,Reshmi.I’ll be posting iddli recipe real soon..may be just after Onam.. I sometimes make onion chutney the same way excluding the ginger. Mine always turns out to be a very light colored chutney. I wonder how u got that bright red color from sauteed onions? Thanks anyways for sharing. Annita, I made this chutney and came out very good, but it was not red as yours, though I used red onion and dried red chilli. Thanks for sharing such an easy recipe. where did you get the steel serving plate with small sections for curries. It looks very beautiful. Do we get it online? what is the name for the plate? Thanks in advance. I got those steel plates from India,geena..I donno if its available in Internet..
And about the chutney,i too didnt get that red color when made it agaian..I think that was from the red chillies I had then..If you really want it to be red,replace some whole red chillies with kashmiri red chilly powder. Thank you for the reply Annita. I will surely buy kashmiri chilli powder next time. I searched online for the stainless Steel serving plate but couldn’t find any. Thanks again Annita, You are very helpful. I will surely look for any such place. Sorry for the late reply. this is one sensational chutney. just like my mom’s. Thanks Shaista..Try it out and let me know if you’ve liked it or not. I have tried few of your recipes and bookmarked many!!! Very nice and interesting blog.. I keep reading it regularly.. 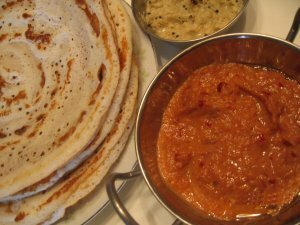 I had made this chutney with dosa last night and really liked it. Hi Annita, I tried this recipe and it tasted great! I’ve put a <a href=”http://svabhava.blogspot.com/2007/04/recipes-from-other-blogs.html” rel=”nofollow”>link</a> to it on my blog. hey nice blog :) finally i found someone on wordpress having a cookery blog…. was going thro ur blog.til seed is also called sesame or gingelly. gingelly oil is cold pressed til seed oil, whereas the chinese use roasted til seed oil also called sesame.gingelly is made from black til seed.The flavour for sesame oil is different because it is roasted white seeds.This is my understanding.